Katie Thompson is a managing partner of the Stevens, Thompson & Sweers Group and began her career as a financial advisor in 2006. 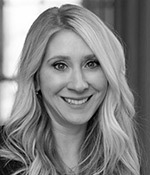 Katie focuses on delivering wealth management planning strategies and goals based investment advice for high net worth individuals, families and businesses. Katie is a First Vice President, Wealth Management Advisor and has earned the CHARTERED RETIREMENT PLANNING COUNSELOR SM designation and the CERTIFIED FINANCIAL PLANNER™(CFP®) certification. * She has been honored by being named to Forbes/SHOOK “America’s Top Next-Generation Wealth Advisors” list in 2017 as well as the Forbes “America’s Best-in-State Wealth Advisors” list in 2018. ** Katie and her husband, Andy, have two young children, Zachary and Gwynn. Katie loves being involved with the National Dance Institute of New Mexico (NDI) and enjoys traveling and spending time with her family.